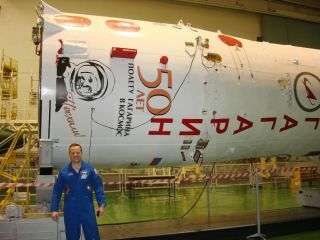 NASA astronaut Ron Garan poses in front of the booster for the "Yuri Gagarin" Soyuz spacecraft that will carry him and two Russian cosmonauts to the International Space Station. This story was updated at 6:38 p.m. EDT. Fifty years ago this month, cosmonaut Yuri Gagarin became the first human ever to fly in space. And he has just gone back — if in name only. Today (April 4), Russia launched three spaceflyers aboard a Soyuz TMA-21 spacecraft that has been christened "Gagarin" to honor cosmonaut Yuri Gagarin and his historic flight, which took place on April 12, 1961. The Soyuz blasted off from Baikonur Cosmodrome in Kazakhstan at 6:18 p.m. EDT (4:18 a.m. April 5 local time) from the same launch pad used during Gagarin's historic flight. The Soyuz "Gagarin" is carrying two Russian cosmonauts and one American astronaut to the International Space Station, where they will join three spaceflyers already there, rounding out the orbiting lab's Expedition 27. Docking is set for Wednesday, April 6. The Soyuz's booster rocket was decorated in grand style for the flight, with a larger-than-life likeness of Gagarin gracing its metal hull, along with the cosmonaut's name and a big, bold "50." Gagarin's flight marked a stinging defeat for the United States in its escalating Cold War space race with the Soviet Union. And it reopened wounds first inflicted by the Soviets' surprise launch of Sputnik 1, the world's first artificial satellite, in October 1957. But those were different times. Today, 50 years later, the Soviet Union no longer exists, and Russia and the U.S. have been longtime partners in human spaceflight. Russia launched the first piece of the International Space Station into orbit in 1998, and NASA followed with the outpost's first U.S. module soon after. So NASA astronauts and officials don't begrudge the Russians their celebration. "We're always happy to see our partners succeed and mark significant milestones," said NASA spokesman Kelly Humphries. NASA astronaut Ron Garan — who is the American flying aboard the "Gagarin" — voiced similar sentiments. NASA has other reasons of its own to celebrate April 12. "It also happens to be the 30th anniversary of the first [space] shuttle mission, so we'll of course be marking that," Humphries told SPACE.com. While Gagarin's name lives on, the man himself died tragically young. His plane crashed during a military training mission in 1968, killing the cosmonaut at the age of 34. The Soyuz "Gagarin" was originally set to launch March 29, but a glitch with its radio communications system pushed the flight back to April 4. The spacecraft will carry Samokutyaev, Garan and Russian cosmonaut Andrey Borisenko, who is making his first spaceflight. The new crew will meet up with the orbiting lab's current residents — cosmonaut Dmitry Kondratyev, NASA astronaut Cady Coleman, and European spaceflyer Paolo Nespoli. Kondratyev, Coleman and Nespoli have been on the station since December and are scheduled to return to Earth next month, while the "Gagarin" crew — and the spacecraft itself — will return home in September, NASA officials said. In 1961, Gagarin launched inside a spherical Vostok capsule, orbited Earth once, then parachuted to a landing 108 minutes later in a Russian field. The accomplishment was a serious blow to American pride. On May 5, 1961 — less than a month after Gagarin's flight — the U.S. countered with a manned mission of its own, sending Alan Shepard up in a Freedom 7 spacecraft. The Expedition 27 spaceflyers will therefore get a special opportunity: marking the 50th anniversaries of Gagarin's and Shepard's flights — as well as the space shuttle's 30th anniversay — while zipping around the Earth at about 17,500 mph (28,163 kph). "I think [it] is really going to be amazing," Garan said. "It's such an honor." While Shepard flew in space in May 1961, he didn't reach Earth orbit. His 15-minute suborbital flight splashed down in the Atlantic Ocean just 302 miles (486 km) downrange of his Florida launch site. The United States didn't send an astronaut to Earth orbit until John Glenn's Friendship 7 mission in February 1962. You can follow SPACE.com senior writer Mike Wall on Twitter: @michaeldwall. For the latest news about the Soyuz "Gagarin" and the International Space Station's Expedition 27, follow SPACE.com on Twitter @Spacedotcom and on Facebook.